Having launched its first Trident model with the 620 in 2016, Outer Reef is working to expand the range which is receiving a lot of interest from its customer base. The Outer Reef 720 Trident project is a proof of this direction and follows the 620 as the second model in the range. Just as the smaller 620 the 720 will feature a semi displacement hull which will be powered by standard twin Cat 641hp engines with line shaft propulsion. Standard interior layout will offer a four double cabin arrangement, with a living kitchen dining area on the main deck. A crew cabin with lobby, utility room, and work bench is located to midships in between the engine room and owners midships stateroom. 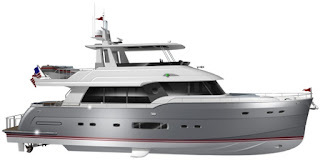 Outer Reef is offering two layouts for the 720 Trident which modify the main deck layout with choice for an astern galley or a central one, and change a bit the flybridge due to the different location of the internal stair case in the saloon moved from port to starboard.